Holiday Cookies from the Chicago Tribune—With Recipes! Baking cookies at Christmastime is a great American tradition. Whether you prepare your cookies from favorite family recipes or from from recipes you cut from magazines or newspapers, you may want to consider adding some new cookies to your repertoire! HOLIDAY COOKIES: Prize-Winning Family Recipes from the Chicago Tribune for Cookies, Bars, Brownies, and More has just been published. The book contains more than 100 kitchen-tested family recipes that were finalists in the Chicago Tribune’s annual holiday cookie contest, which has been running since 1986. Here are a few samples from the book. First, the gorgeous photos, courtesy of the Tribune. Then, at the bottom of the post… the recipes! Let’s start with the Snowflake Sugar Cookies. And, if you’re a chocolate lover, Mrs. Levy’s Giant Chocolate Chip Cookies. 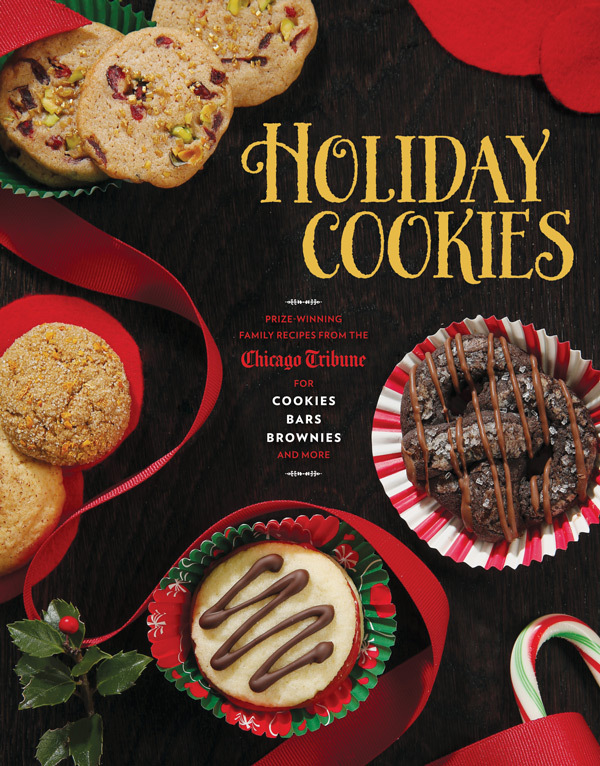 HOLIDAY COOKIES: Prize-Winning Family Recipes from the Chicago Tribune for Cookies, Bars, Brownies, and More has a list price of $24.95. From Agate Publishing of Evanston, Illinois. 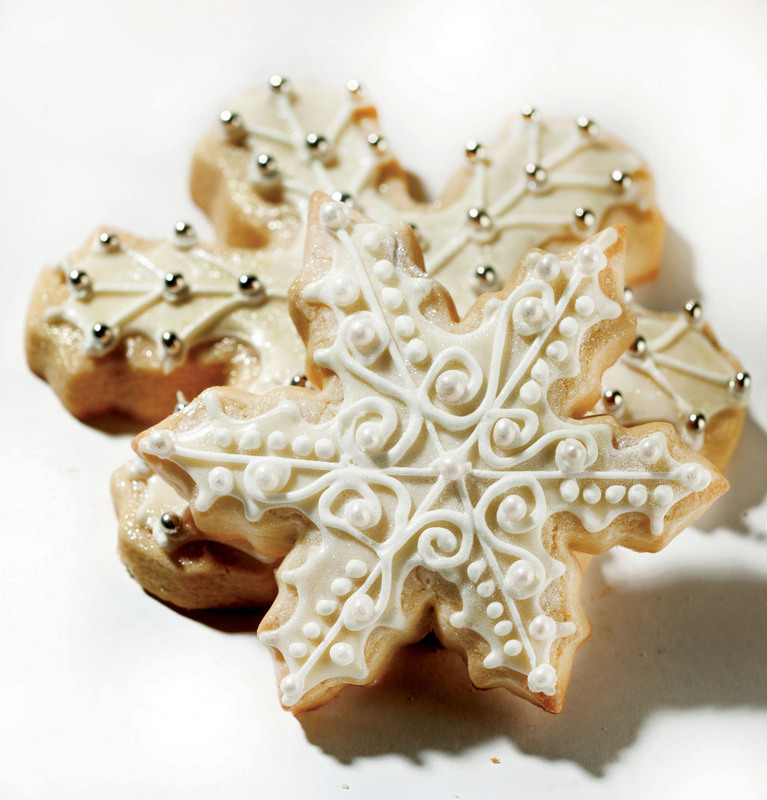 Meagan Fricano received an honorable mention in 2011 for these beautiful cookies, which shimmered, sparkled and glowed. Fricano, a neurobiologist, used forceps to apply her silver dragees. Combine the flours and baking powder in a bowl; stir to evenly distribute the baking powder. Set aside. In a 6-quart stand mixer with a paddle attachment, cream the butter and sugars until light and fluffy. Add the salt, vanilla and milk; mix to blend. With mixer running, add eggs and extra yolk, one at a time, waiting until each is combined before adding the next. Reduce the mixer speed to low; slowly add flour mixture. Add additional all-purpose flour 1 tablespoon at a time until the dough is no longer sticky to the touch. Turn dough out onto plastic wrap; divide in half. Wrap each portion in plastic wrap; form into flat discs. Refrigerate 4 to 48 hours, or freeze up to a month. Heat oven to 375 degrees. Let dough warm up slightly; roll out to ½ inch thick using powdered sugar (not flour) to stop it from sticking. Cut out snowflake shapes; bake on parchment-lined baking pans until just barely starting to brown on the edges, 12 to 15 minutes. Remove promptly from oven; let cool on the sheet pan, 2 minutes. Transfer to a wire rack to cool completely before decorating. For icing, mix the meringue powder and powdered sugar in a medium bowl; slowly add water until the frosting reaches desired consistency. Add a little gel food coloring, if desired. For best results, start with a stiff frosting, put some aside in a parchment baking bag or zip-top bag, then add water to the remaining frosting. Use the stiff frosting to pipe outlines on the cooled cookies, then carefully apply the thinner icing to fill in the cookies between the piped outlines (a toothpick helps to carefully move thin icing into small spaces). 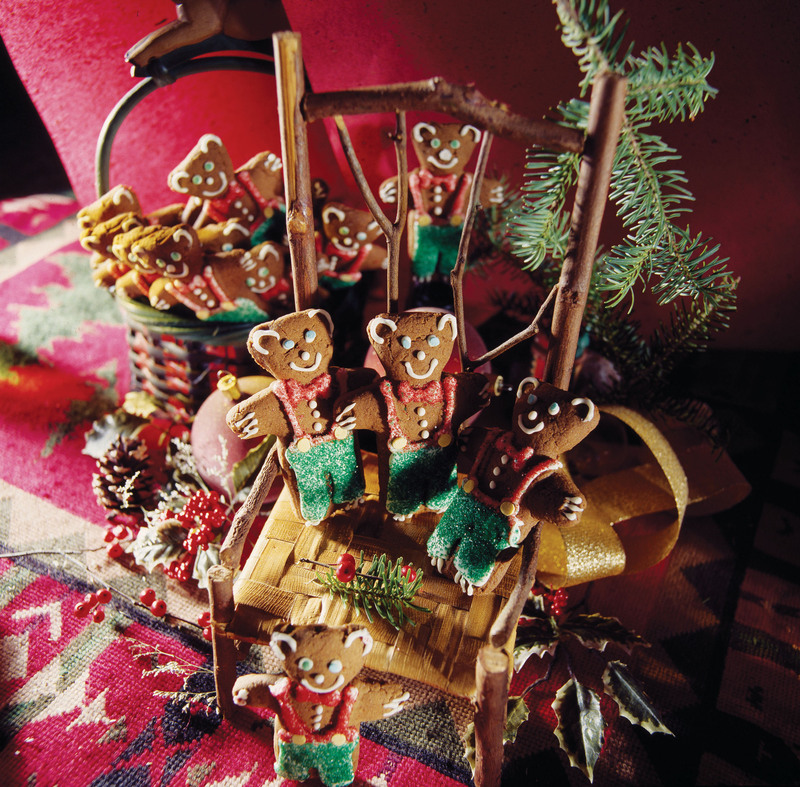 Nancy Schubert took first place in 1992 with these chubby little bears. When she was growing up, “Gingerbread Saturday” was a tradition in Schubert’s house, and she and her sister would spend the day rolling dough, cutting shapes, and baking and decorating cookies. To decorate the bears, she used colored sugar, little candies, and a classic royal icing. Confectioners’ sugar icing or tubes of decorator icing also can be used. Measure 31/2 cups flour; sift together with spices, baking soda and salt; set aside. Beat butter with an electric mixer in a large bowl until smooth. Add sugar and mix on high speed until light and fluffy, 2 minutes. Add egg and mix well. Stop the mixer and add molasses and lemon rind. Mix on low speed to combine. Stir in dry ingredients with a wooden spoon. Heat oven to 375 degrees. Lightly grease baking sheets. Remove one piece of dough from the refrigerator at a time. Roll the well-chilled dough on a floured board or between sheets of waxed paper to a 1/8-inch thickness. Cut out with cookie cutters and carefully transfer to prepared baking sheets, leaving 1-inch between each cookie. Bake just until the cookies are lightly browned and set, 7 to 10 minutes. Do not overbake. Transfer from baking sheets to a wire rack and cool completely before decorating. Decorate as desired. Store in airtight containers. Heat oven to 375 degrees. Beat sugar, butter and vanilla in a large bowl with a mixer until light and fluffy. Beat in eggs until lighter. Add flour, salt and baking powder; beat just until mixed. Stir in walnuts and chocolate chips. 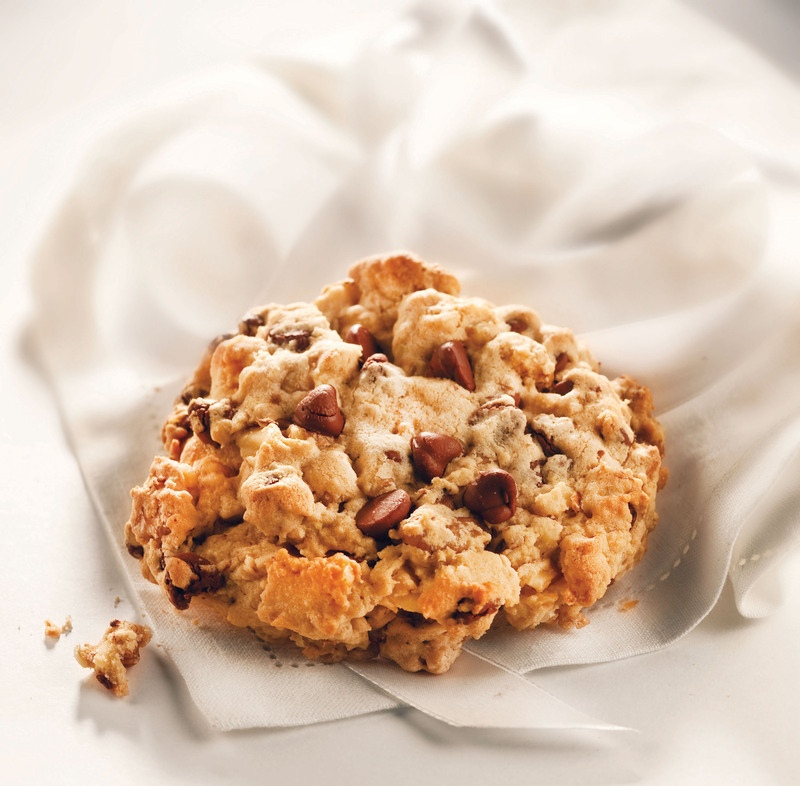 Drop cookie mixture by ½ cup measure onto greased or parchment-lined baking sheets, leaving plenty of space between. Flatten each cookie slightly with back of fork. Bake until golden, about 15 minutes. Cool on sheet 2 minutes; transfer to a wire rack. Cool completely. One more pic! 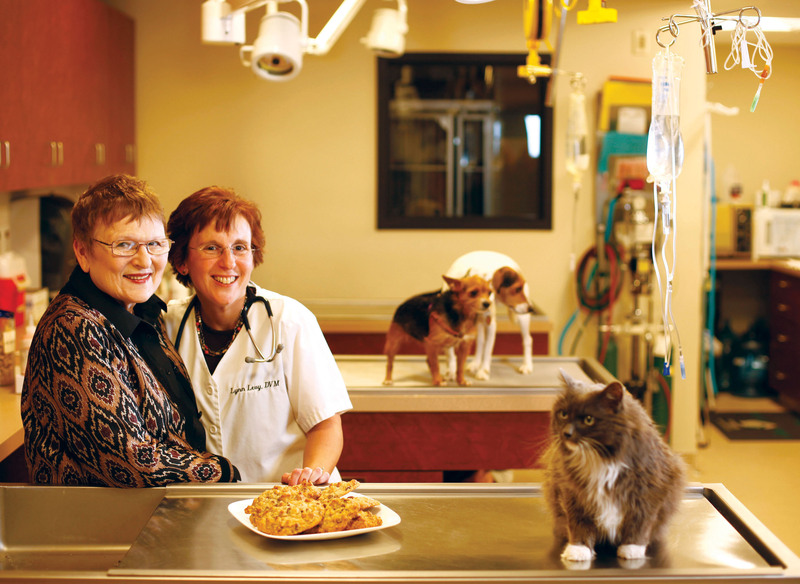 That’s Lynn Levy (right), the chocolate chip cookie maker, with her mom Adele. Thanks, Lynn, and everyone for sharing your recipes! This entry was posted in Recipe and tagged Agate Publishing, Chicago Tribune, Gingerbread Bears, Holiday Cookies, Mrs. Levy's Giant Chocolate Chip Cookies, Snowflake Sugar Cookies. Bookmark the permalink.